I cannot believe that Halloween is already tomorrow! October has flown by (like every other month this year) and I barely even thought about Halloween costumes or food ideas until this week. I have a party to go to tonight and I didn't even decide on a costume until yesterday when I went to the drugstore and chose a few devil accessories from the 40% off Halloween section, so I'm probably going to be the most unoriginal one there. I haven't had time to come up with Halloween food or dessert ideas either, which is disappointing because Halloween is the perfect excuse to get creative with your food! 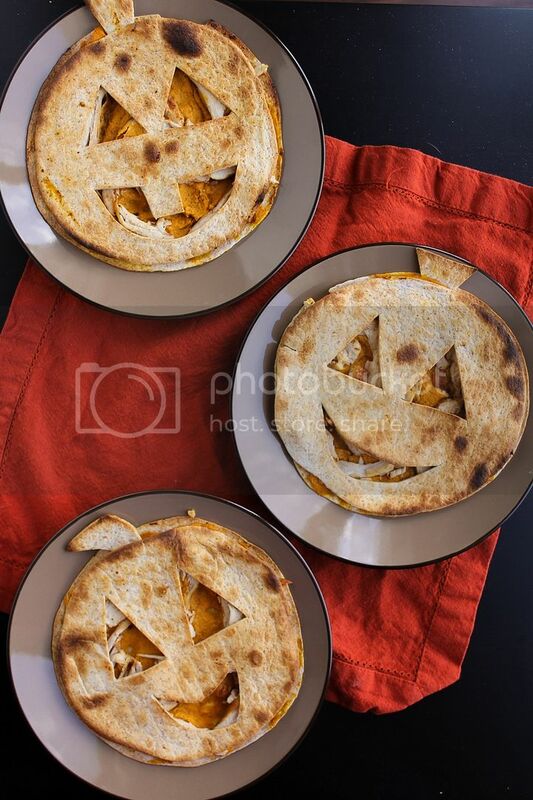 I couldn't let the holiday pass without at least one Halloween recipe on my blog though, so I threw these pumpkin quesadillas together the other day - and I loved them! These quesadillas are filled with a creamy mixture of spiced pumpkin and goat cheese, along with some chicken for protein. That's it! 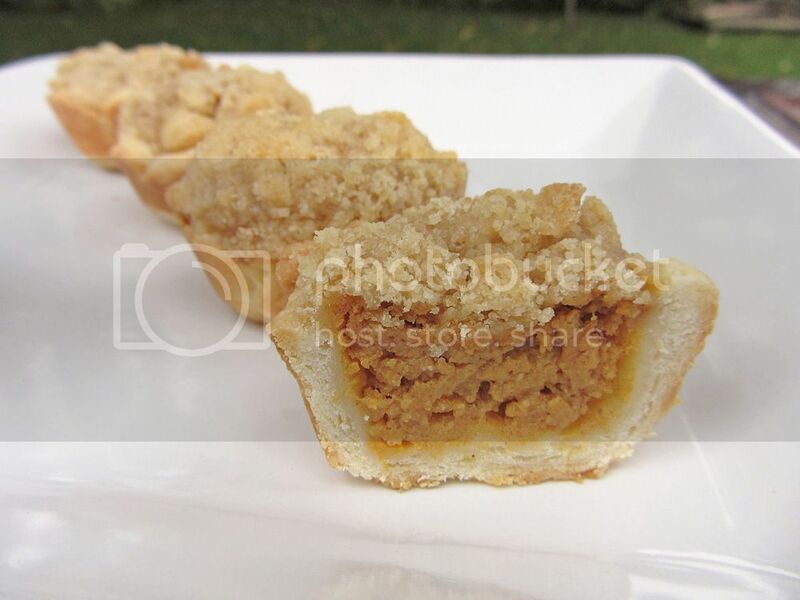 Very few ingredients but they surprised me in how good they tasted, plus they were really easy to make. 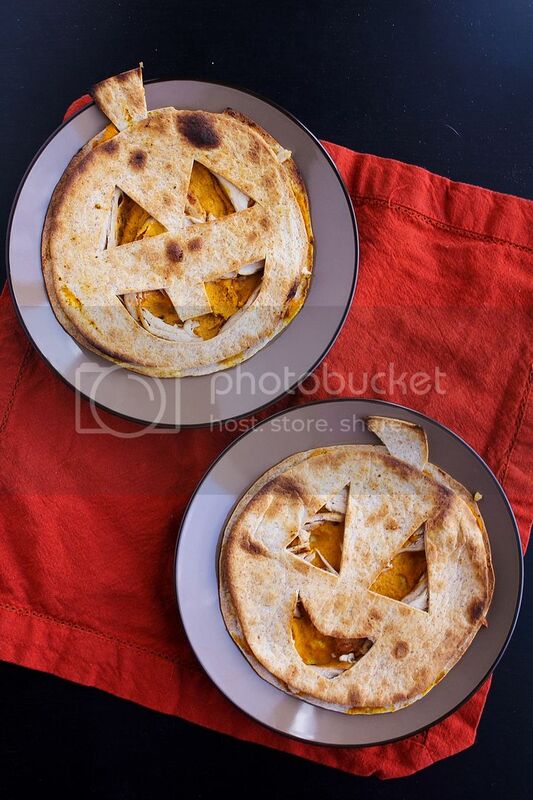 Carving a pumpkin face in a tortilla is WAY easier than carving an actual pumpkin, and you can throw multiple quesadillas under the broiler to quickly cook them and avoid having all the filling fall out through the holes like they would if you tried to cook them on a skillet. These are perfect for Halloween night because you can easily prepare them for an early dinner before the kids head out trick or treating. You could also change up the filling to include whatever you want - I imagine kids would be much happier with a simple cheese-only version! And if you're looking for more Halloween food ideas (since clearly I am not full of costume ideas), check out my Pinterest board. Hope everyone has a safe and happy Halloween tomorrow! Trim chicken breasts of any fat and season on both sides with chili powder, salt, and pepper. Heat a large skillet over medium-high heat and cook chicken breasts for about 5-6 minutes per side, or until cooked through completely. Set aside. 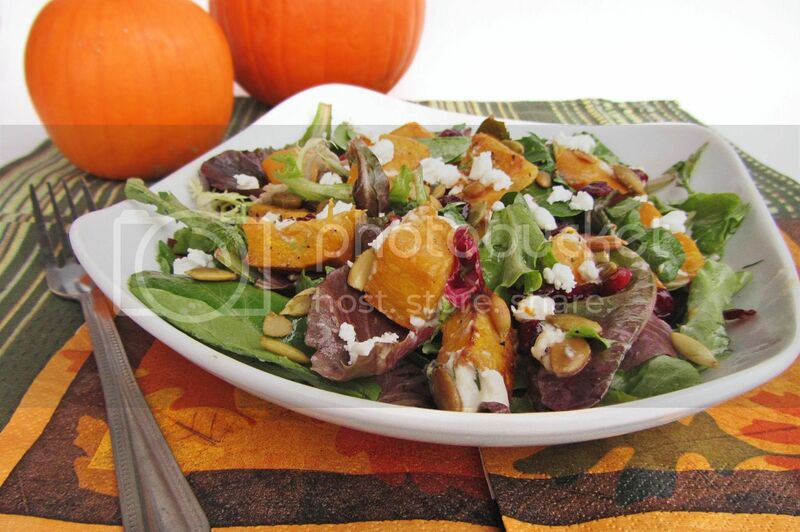 Mix pumpkin, goat cheese, cumin, chili powder, and a pinch each of salt and pepper in a medium bowl. Taste mixture and adjust any amounts to your liking. Slice or shred chicken thinly. Use a small knife to carve pumpkin faces into 5 of the tortillas - these will be the tops of the quesadillas. Save the triangles you cut out from the eyes to be the pumpkin stems. Spread about 1/4 cup of the pumpkin mixture onto each of the 5 bottom tortillas. 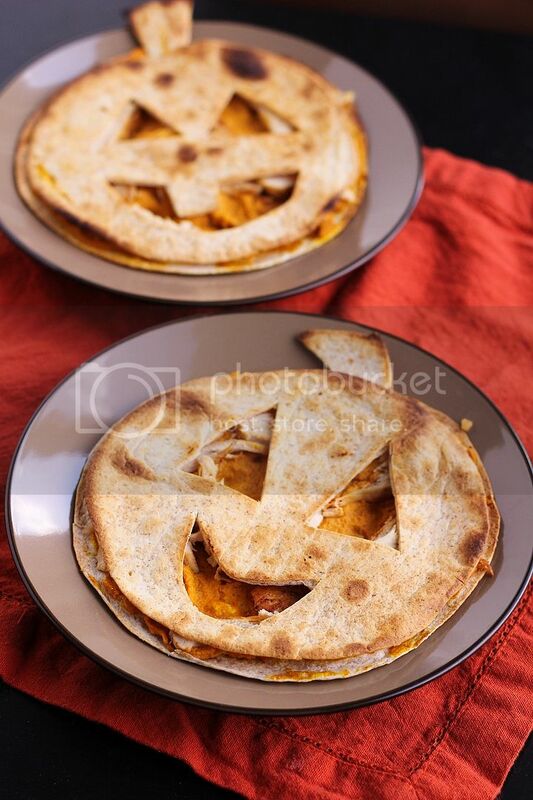 Top pumpkin mixture with shredded chicken, followed by the carved tortilla to form 5 complete pumpkin quesadillas. 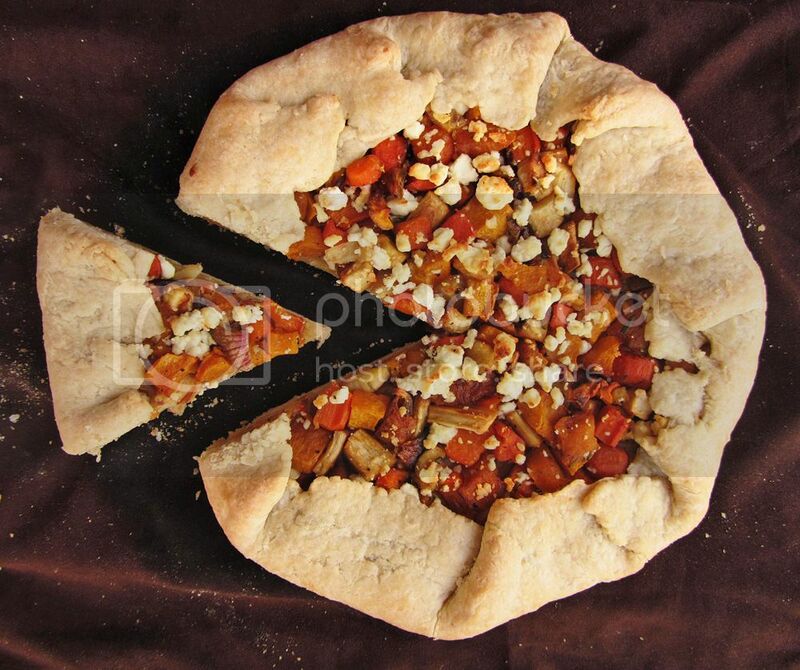 Insert the triangle in between the tortillas near the top, pressing it into the pumpkin mixture, to be the stem. Press the top tortilla gently onto the bottom tortilla to help them stick together. Spray baking sheets with non-stick baking spray, carefully transfer quesadillas to baking sheets with carved face up, spray tops lightly with cooking spray, and broil on top rack of oven until warmed through and toasted spots begin to appear on top. This should only take a few minutes – watch closely. Transfer quesadillas carefully to plates as they won't stick together as much as regular quesadillas because of the goat cheese. Serve warm. Sorry for the lack of posts lately – two Saturdays ago I travelled up to Northern Ontario to visit family for Thanksgiving and stayed just over a week. I had fully intended to go about my regular routine while I was up there, getting lots of work done, staying caught up with my Feedly reader, and writing a couple blog posts, but before I knew it I was boarding a plane back home and I’d done almost none of the above. I really have no idea where the time went, though I do know I enjoyed it! As usual, I was spoiled on my trip and almost never had to make any food for myself. 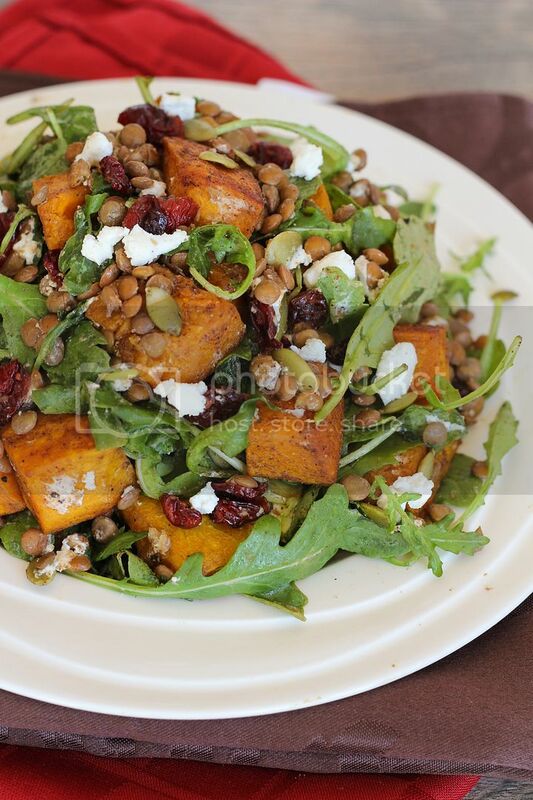 The one dish I made the whole week was this squash and lentil salad, which we enjoyed with some butternut squash soup as a nice lighter meal after our big Thanksgiving feast. 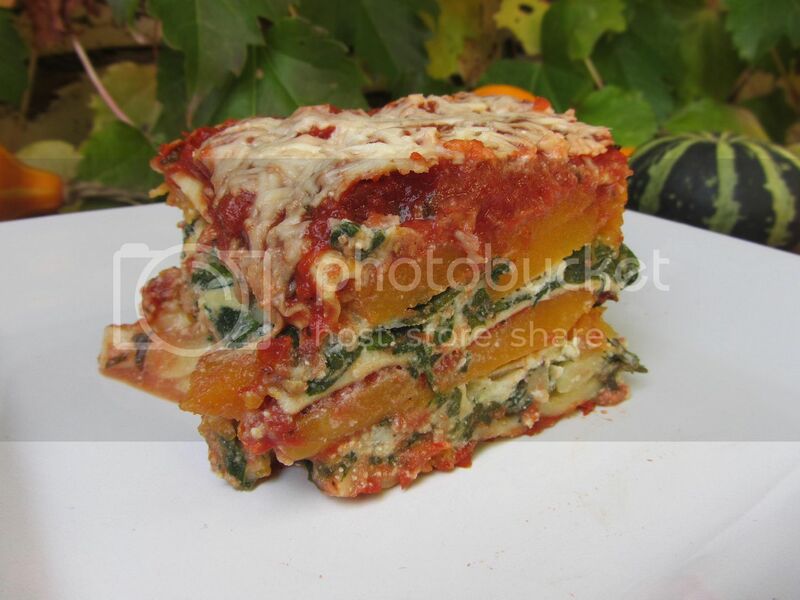 I offered to make it because I’d been eating it for my lunches the whole week before I left and I loved it so much that it was still on my mind! Somehow, whenever I’m under pressure to make something for guests, it never turns out as well as when I make it the exact same way for myself at home (or maybe I'm extra critical when I know it's being judged), but everyone still enjoyed it! 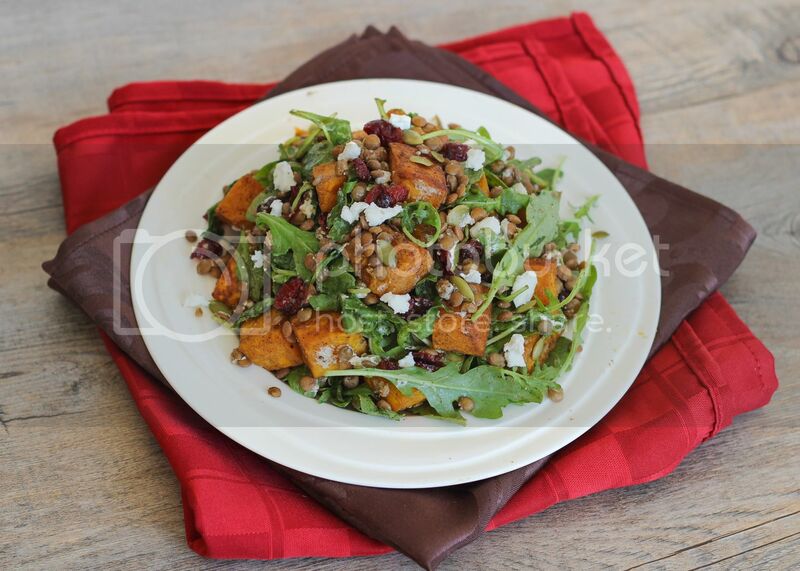 This salad is bursting with fall flavour and is hearty and filling thanks to the lentils and squash, while still feeling light and healthful. It takes a bit of time to roast the squash and cook the lentils, but other than that everything comes together pretty easily. 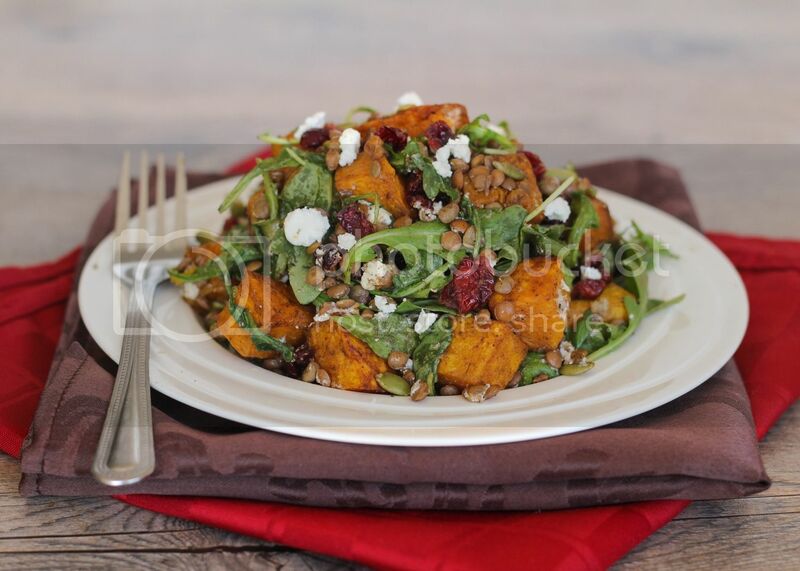 I didn’t change much from the original Bon Appetit recipe except to add pumpkin seeds and cranberries, which add some crunch, sweetness, and even more of a festive feel to the salad. 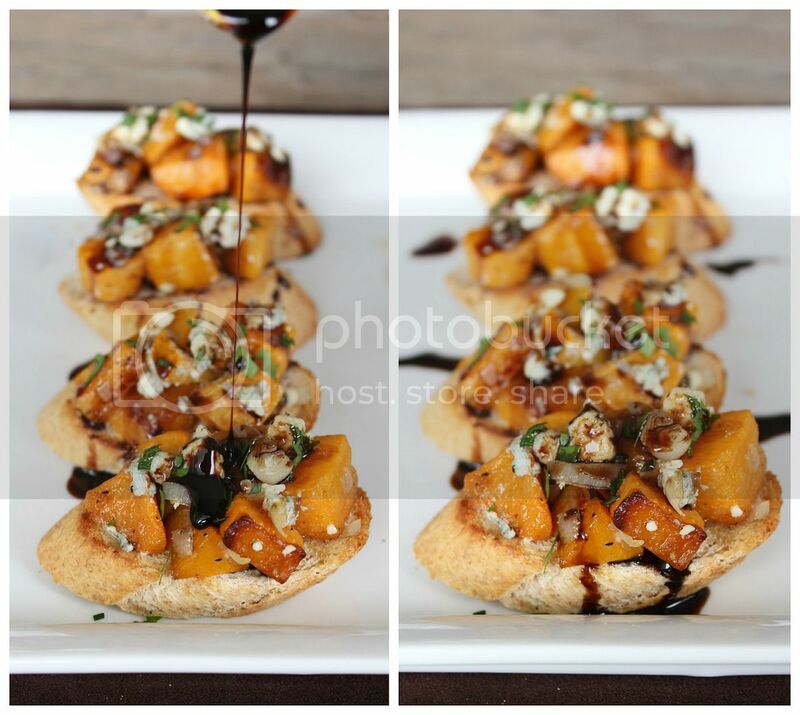 I can't believe that now that I'm back, it's already time (or past time) to start thinking of Halloween recipes! 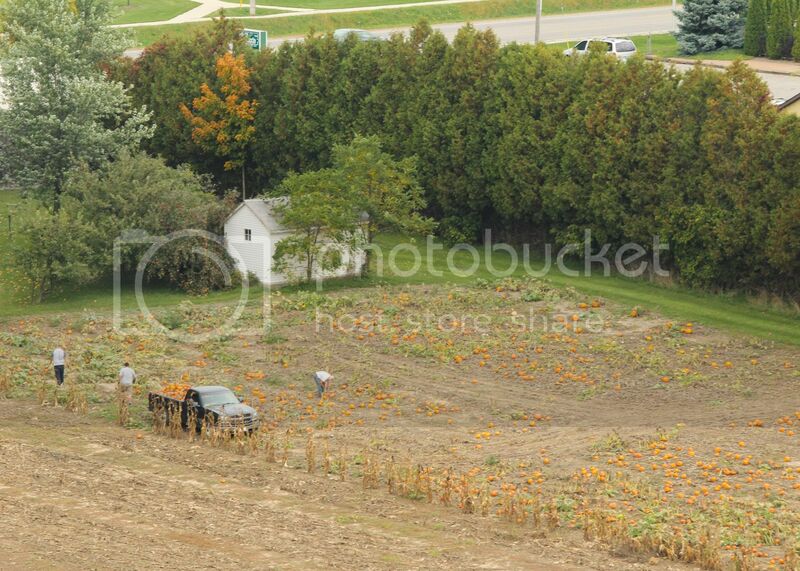 It's crazy how fast October is flying by - hope you're all enjoying it as much as I am! Preheat oven to 375°F. 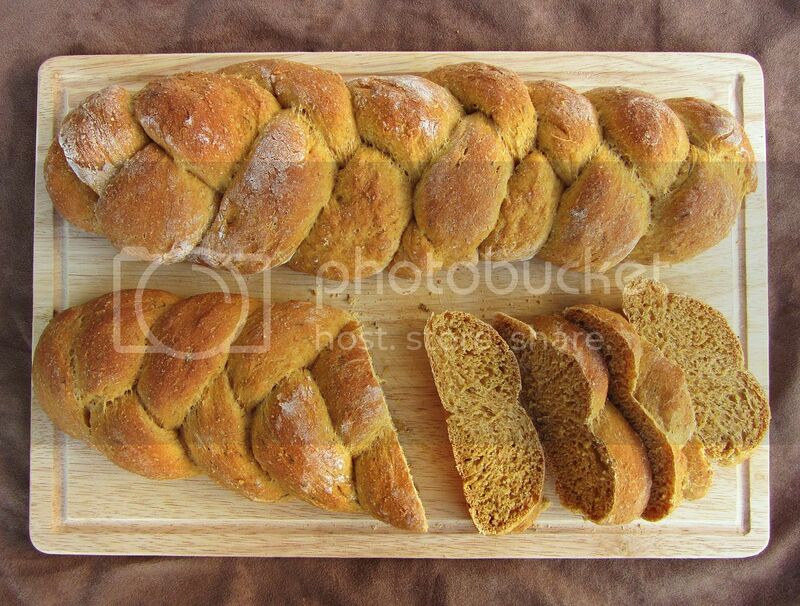 Peel butternut squash, remove seeds, and cut into about 1” cubes. I find it easier to cut squash after microwaving it first – just prick it all over with a fork or small knife and microwave on high for about a minute. Toss cubes of squash with 2 tablespoons oil, the cumin, paprika, and salt. 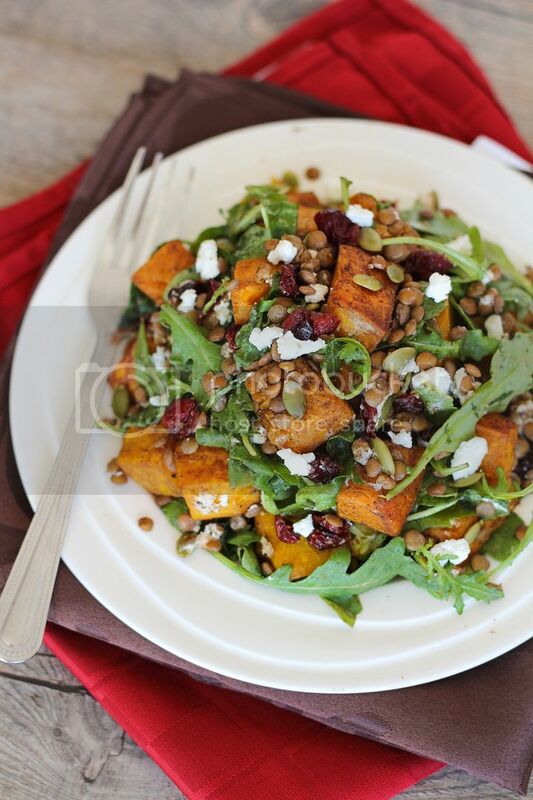 Spread squash in an even layer on a foil-lined baking sheet and roast for 20 minutes. Toss, return to oven, and roast for another 10-15 minutes. Let cool. Meanwhile, bring around 3 cups of water to a boil in a medium saucepan. Add lentils, cover, reduce heat to simmer, and let cook for about 30 minutes, until tender but firm. Drain and rinse lentils under cold water. 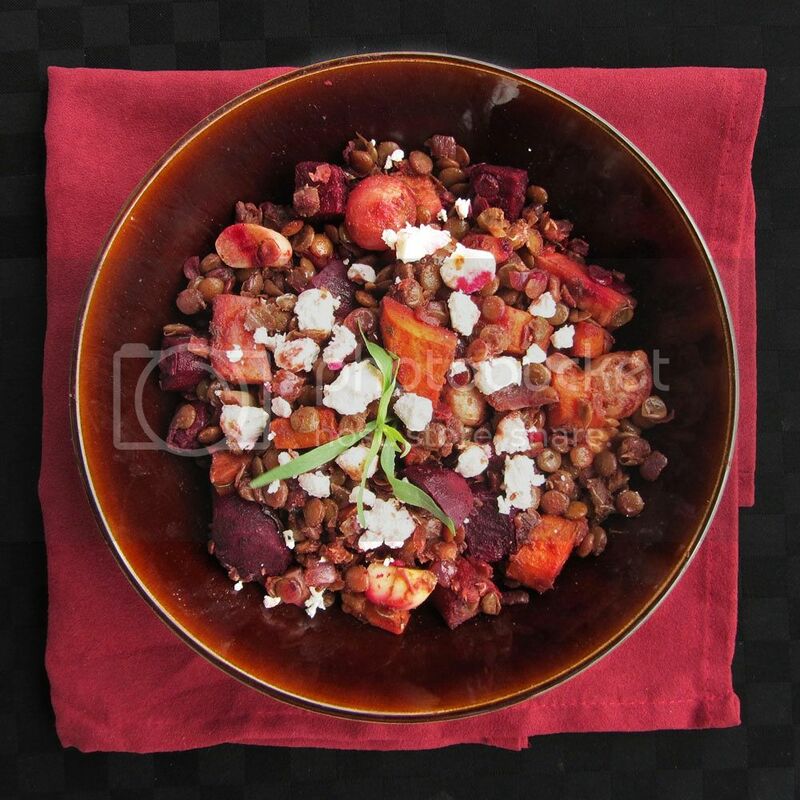 Combine lentils, squash, arugula, about half the goat cheese, pepitas, cranberries, balsamic vinegar, and remaining 1 tablespoon of oil in a large bowl. Season with salt and pepper. Divide into servings and top each with remaining goat cheese. I know I just posted a panini recipe fairly recently, but this new panini was so good that I had to share it with you guys immediately! 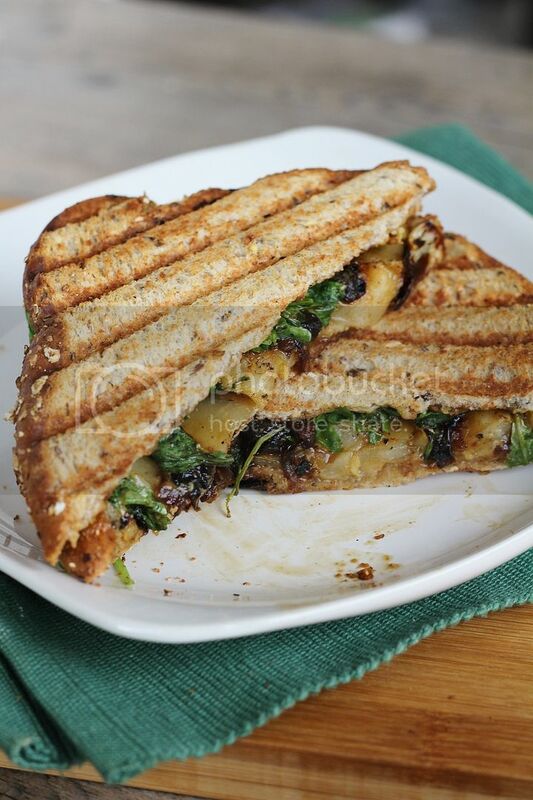 I wanted to make an autumn-ish panini with one of my favourite flavour combinations – pears or apples with blue cheese and caramelized onions. I’ve used at least a couple of these ingredients together in the past, like in these apple, caramelized onion, and blue cheese naan pizzas, apple turkey burgers with caramelized onions and brie, and roasted potatoes and green beans with caramelized onions and blue cheese – there’s something about caramelized onions and blue cheese together that I just can't get enough of. 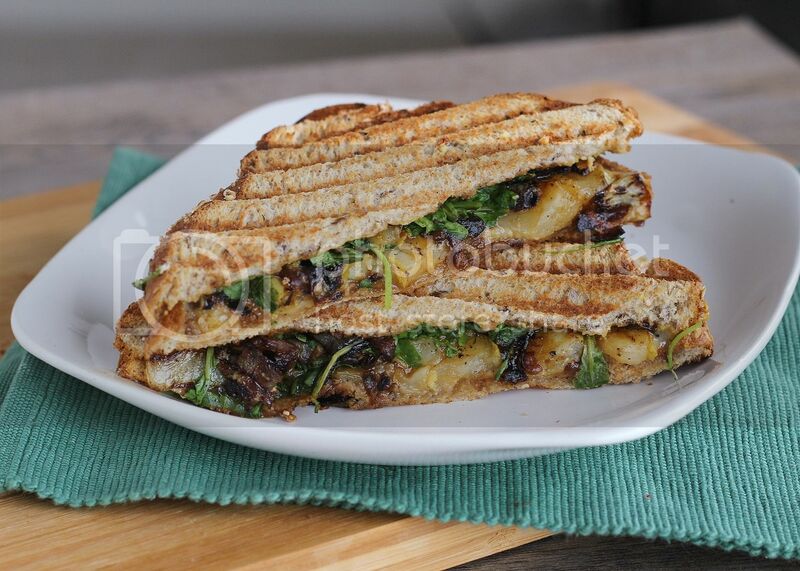 Add in some juicy, lightly sautéed pears, some peppery arugula and spicy honey Dijon, press it together until it's warm and melty, and you have what may be my new favourite sandwich! And before someone points it out, yes I’m aware that the onions as pictured above are much more on the burnt side than the caramelized side – I swear I do know how to caramelize onions, but I only had a tiny onion to work with that had been open in the fridge plus I was in a big rush when I made this. 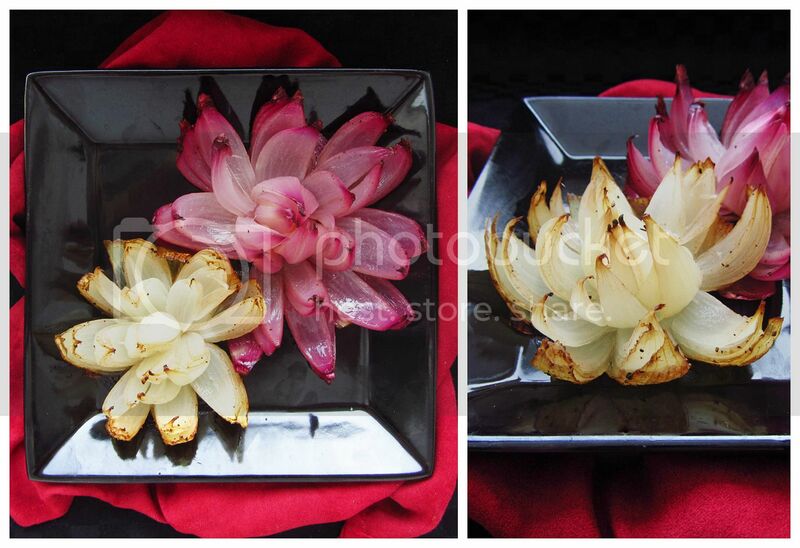 Too thin slices + too high heat = burnt onions. 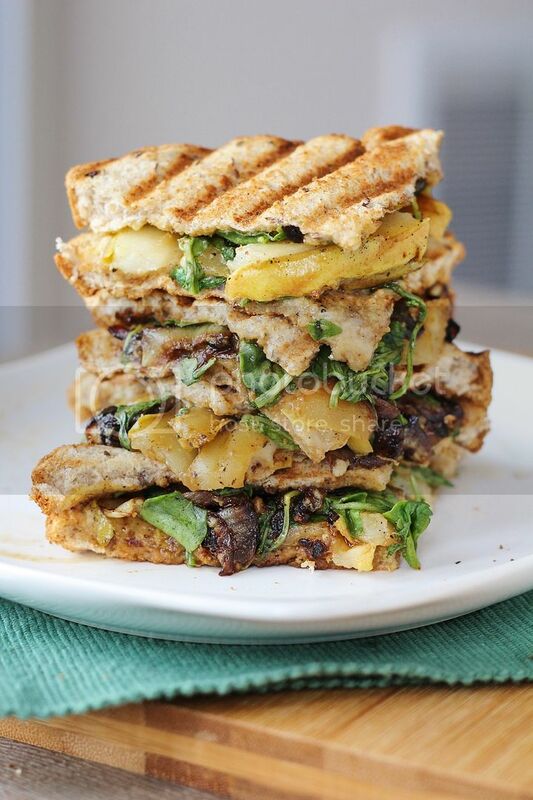 Try not to make the same mistake I did, but if you’re really in a hurry, you could leave them out and this panini would still be delicious; I recommend making time to add them in though - caramelized onions make everything better! 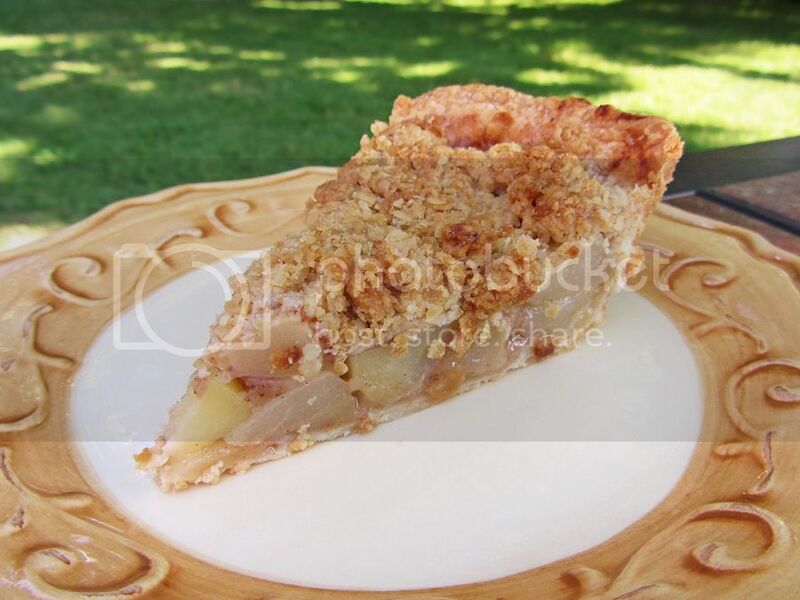 Plus they can always be made ahead of time and stored in the fridge to add to all sorts of things! I’ve also been on a big blue cheese kick lately, adding it to anything I can think of, but I know a lot of you don’t like blue cheese (though I cannot understand why! 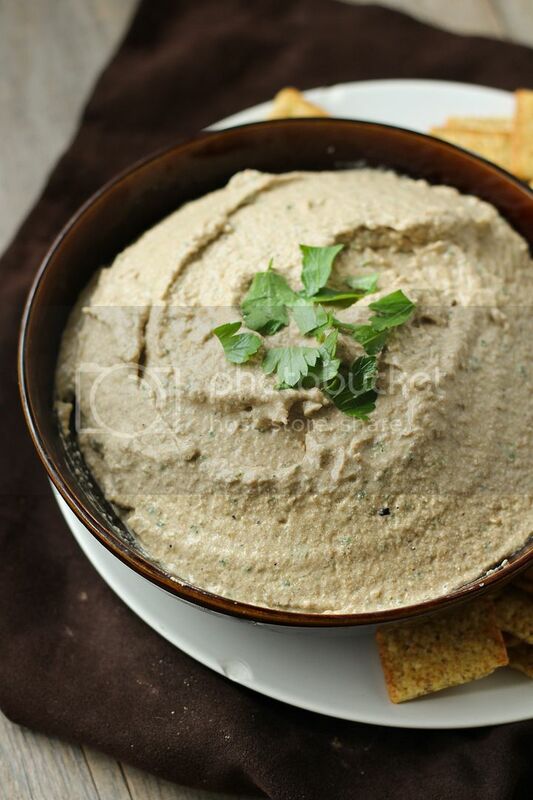 ), so you could substitute something like brie or gruyere instead if you like. Your sandwich will have a different flavour profile, but will still be amazing and even more melty! Heat oil in a medium to large skillet over medium heat. Add onions, stir to coat with oil, and season with salt and pepper. 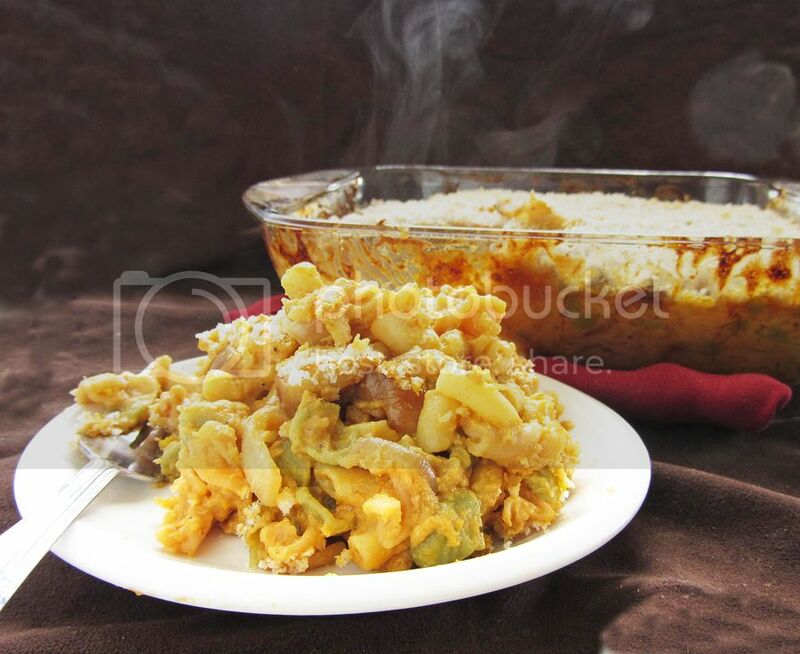 Let cook over medium-low heat, stirring occasionally, until onions are soft and caramelized, about 25-30 minutes. I like to add a splash of balsamic vinegar in the last few minutes of cooking to deglaze the pan and add some flavour to the onions, but this step is optional. Remove onions from pan, and add sliced pear. Cook over medium heat for around 3 minutes, until softened and slightly golden coloured. Remove from heat. 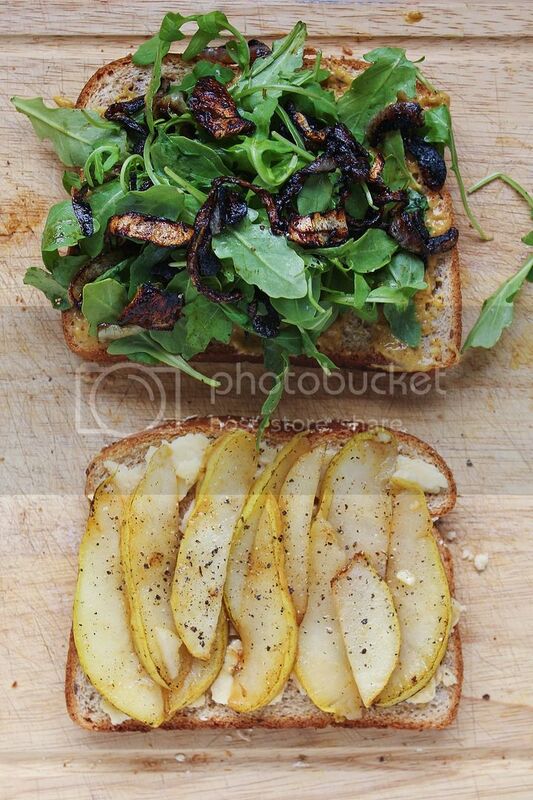 Spread mustard on one slice of bread, top with arugula, onions, pears, and blue cheese, and the other piece of bread. Heat in a panini press, or if you don’t have one, heat the sandwich on a griddle pan (or skillet) with a heavy pot on top of the sandwich to press it into the skillet (I put a can inside the pot to weigh it down), then flip and repeat on the other side. Serve warm. I can't believe it's already time (or past time, actually) to do another monthly recap - September FLEW by! I've been sitting here trying to remember what I actually did this month to talk about in this post and I can't think of a single interesting or exciting thing - I really have no idea where the month went! Most of my free time has been spent going to fitness classes (lately I've been doing Zumba, step, sculpt, and yoga), trying to keep up with outdoor running (I'm now able to run 5k, though I still hate it! ), watching football, and managing my failure of a fantasy team. This is my first year doing fantasy football and now I finally understand why people get so addicted to it but also get so frustrated with it! 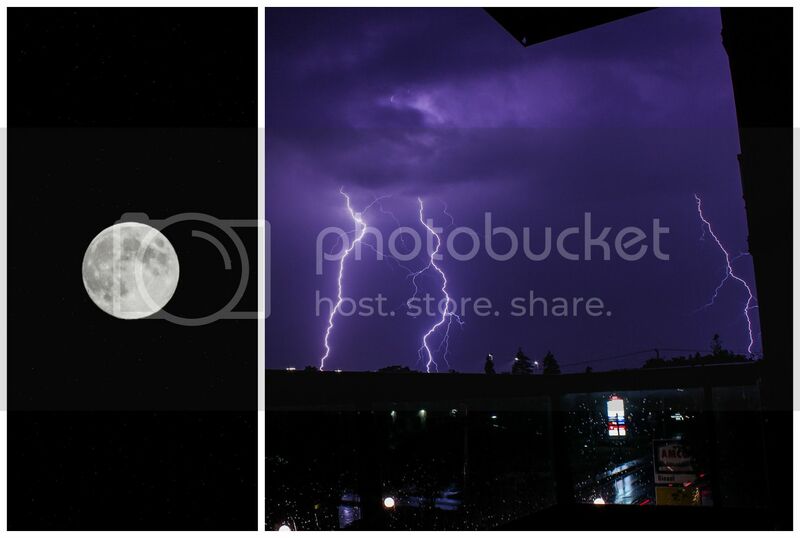 The only non-food related things I have pictures from this month are the harvest moon (though you can't really tell in my picture) and a crazy storm we had with lots of lightning. I always love sitting on my balcony whenever there's a storm and trying to capture lightning in a photograph - it's really challenging so I get so excited when I manage to get some lightning in a shot! The good news is that I did make a ton of food this month, so I still have lots to share with you guys! Actually I'll start with a meal my parents made earlier in the month that was probably the best pizza I've ever had. 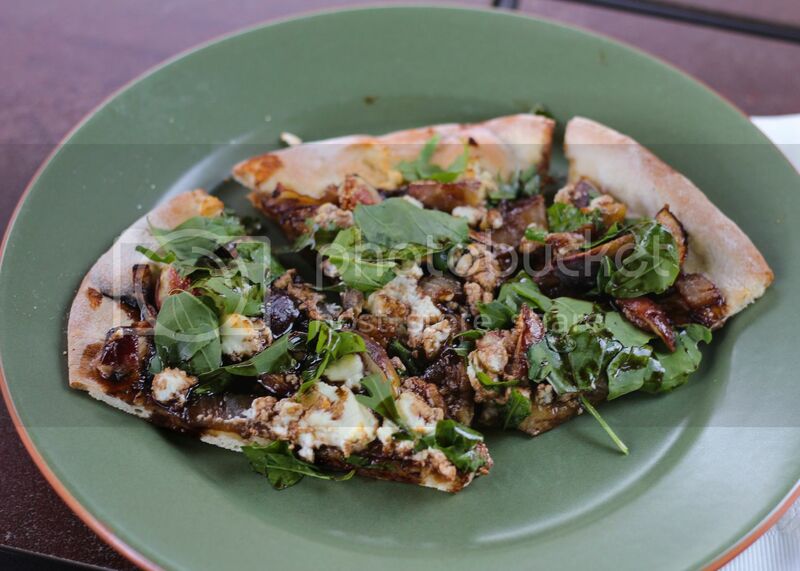 It was topped with figs from my dad's fig tree, goat cheese, onions, arugula, and balsamic reduction. The recipe is from The Shiksa in the Kitchen and if you can get your hands on fresh figs, I highly recommend you try this! 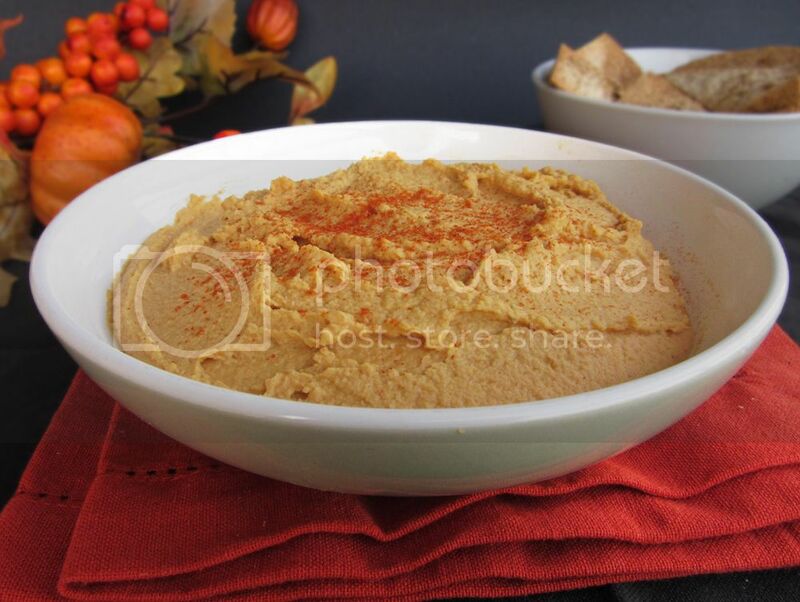 The return of football Sundays has marked the return of football food as well! 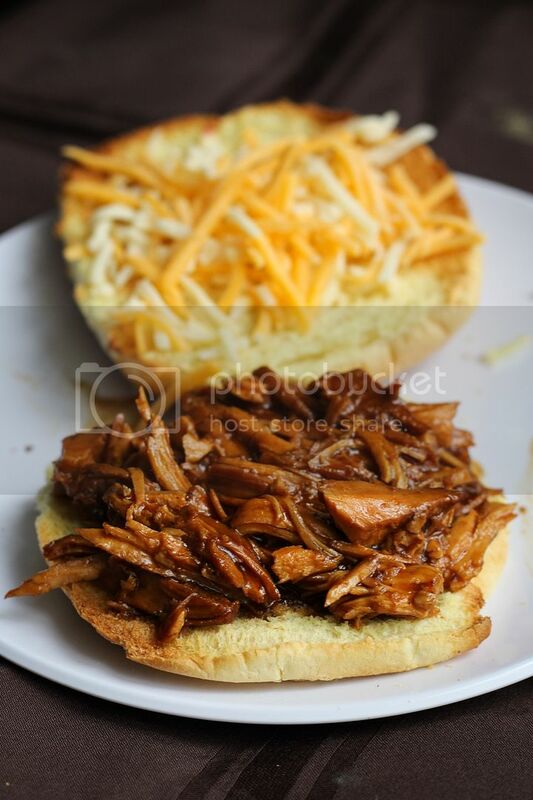 One of my favourite things Ryan and I have enjoyed while we watch the games and constantly refresh the scores on our fantasy teams was this slow cooker bbq chicken. It was super easy to make - you just have to throw some chicken breasts, spices, bbq sauce, and beer in a crockpot and let it cook all day, then shred it up and eat it however you like. 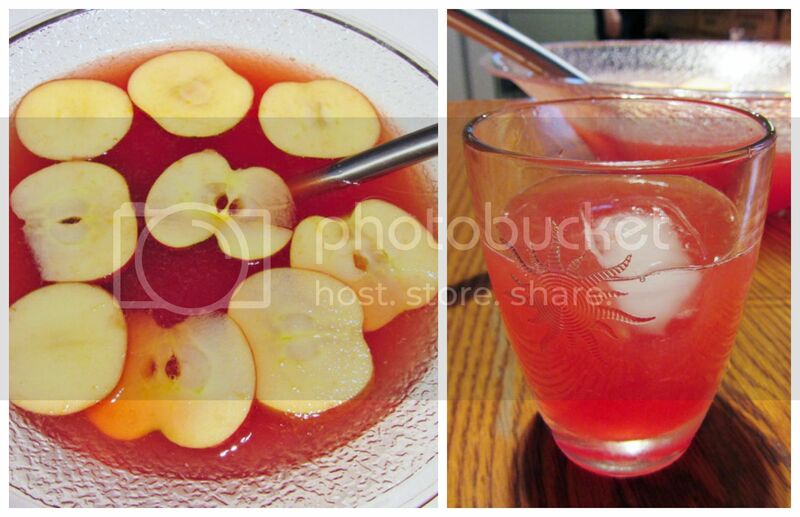 The recipe I used is from How Sweet It Is and it was delicious - I will definitely be making this again! 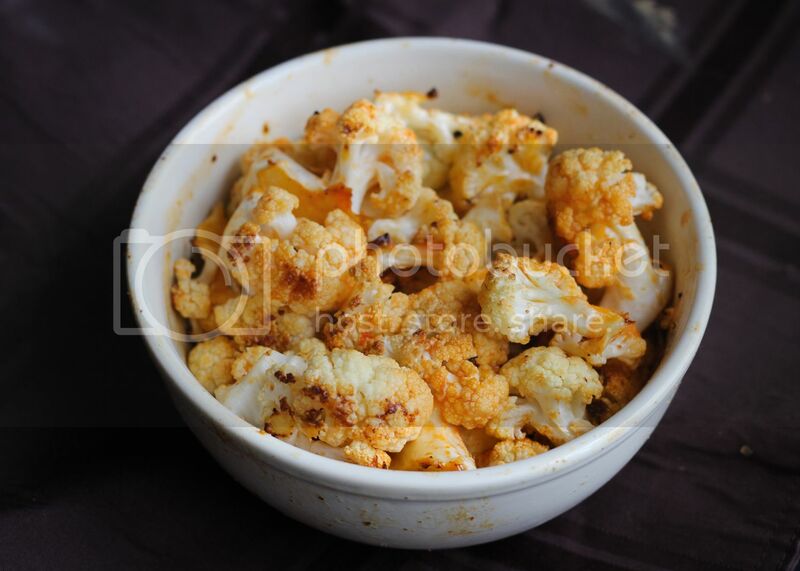 I've also made buffalo roasted cauliflower as a healthier football snack a few times this month. I just chop up a head of cauliflower into florets, toss them with a bit of olive oil, salt, pepper, and a buffalo seasoning we got from Buffalo Wild Wings, roast them at 350 for around half an hour, then toss them with some buffalo sauce. 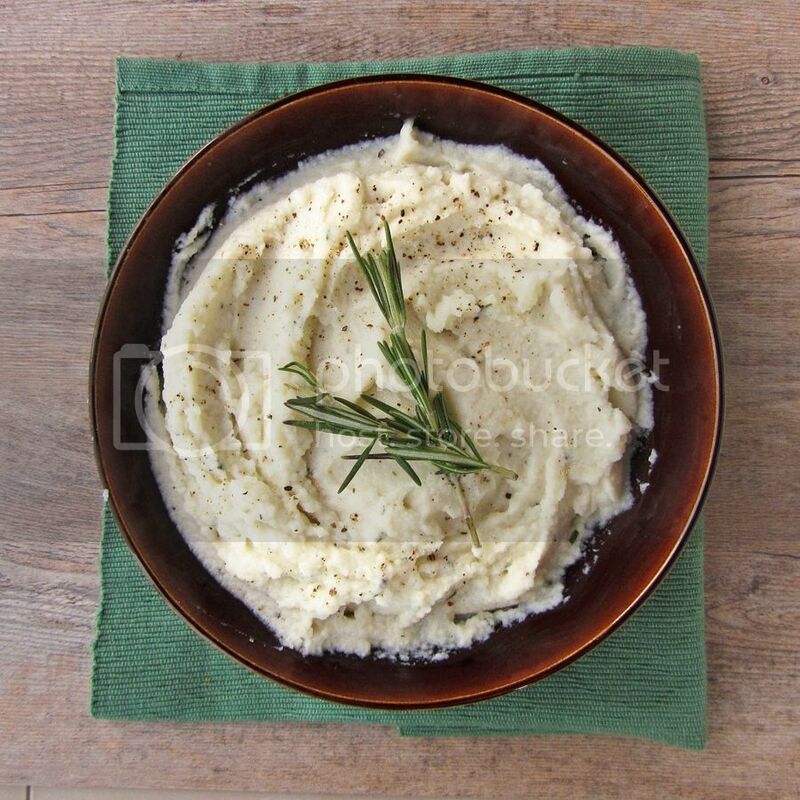 Ryan, who claims he hates cauliflower, actually liked this, which says a lot about it! 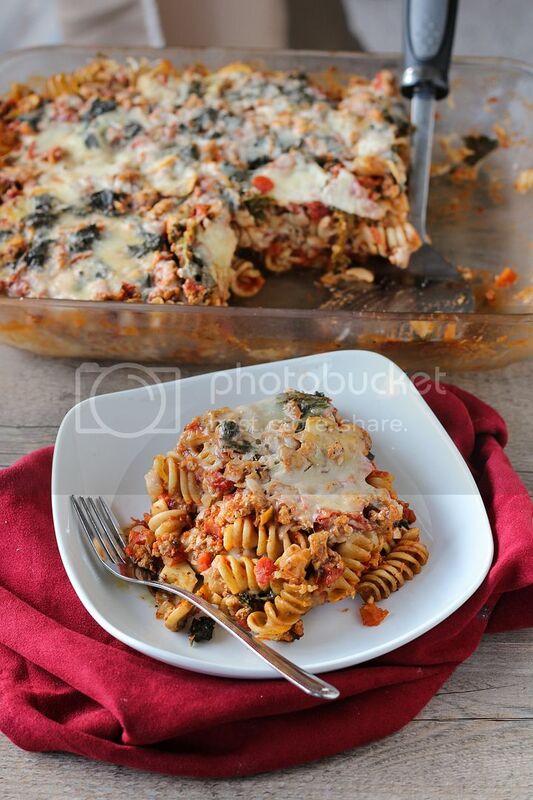 I loved this turkey and kale pasta bake that I made this month because it gave me healthy and filling lunches for a whole week. You can get the recipe from ifoodreal - I followed it pretty closely but threw in some mushrooms one time and zucchini a second time I made it for some extra veggies. This picture was taken of my leftovers which is why the cheese looks weird - I promise this is way tastier than it looks here! 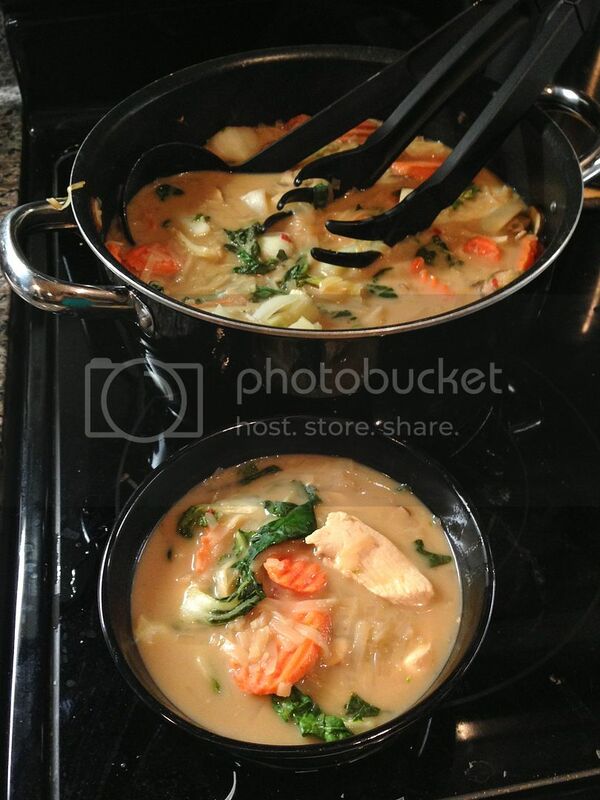 Another new meal I tried this month and loved was this Thai chicken coconut soup, which had chicken, veggies, rice noodles, and a spicy broth made with chicken broth, coconut milk, ginger, and lime. You can get the recipe from Epicurious - the only change I made was to use baby bok choy instead of spinach. I made this Guinness cheddar dip to bring to a division party with my fellow grad students this month. I based it on a recipe from The Parsley Thief which I've wanted to try forever, but I made a few changes including adding caramelized onions, leaving out the half and half, using a mixture of white cheddar plus Guinness cheddar instead of regular cheddar, and increasing the amount of Guinness beer from 1/4 cup to 1 cup. The last change was actually a mistake - I had set aside a cup of beer with the intention of starting off by adding a little then increasing the amount to taste, but I forgot and dumped it all in at once. With the addition of the already quite strong Guinness cheddar, this gave the whole dip a very strong (and slightly bitter) Guinness taste, so it didn't turn out quite how I'd hoped, but I still liked it! Finally, I made these oatmeal cookie pancakes for Ryan and I to enjoy for breakfast one weekend, and we both loved them. 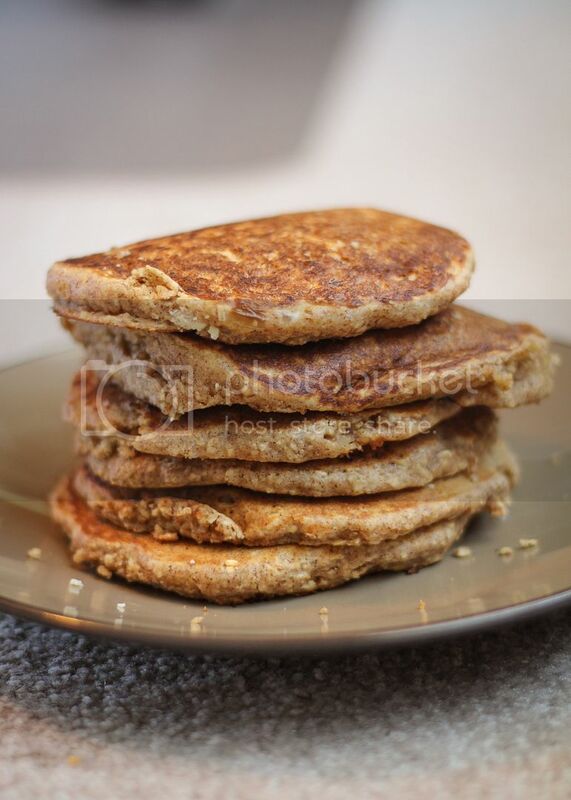 The recipe is from Yammie's Glutenfreedom, and they really taste like oatmeal cookies! I added white chocolate chips because that was all I had around, but next time I'd definitely use semisweet. And there will be a next time! 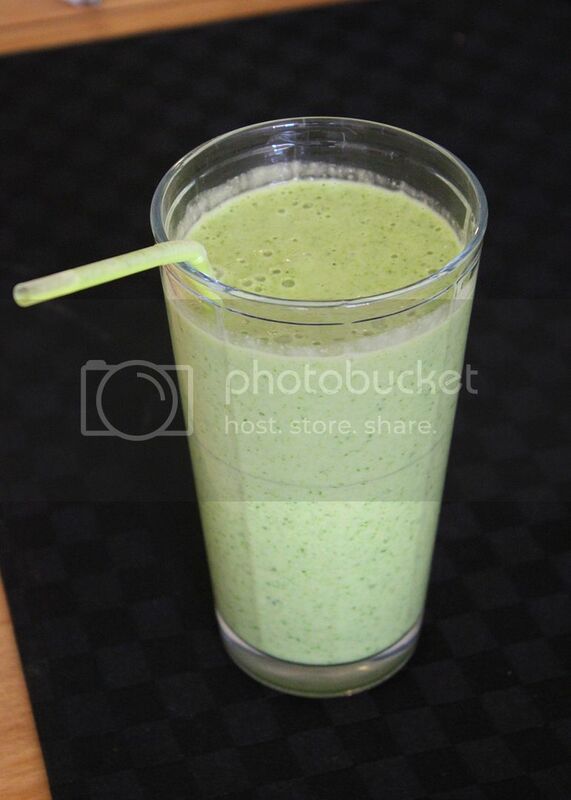 Starting my day with green smoothies! Peanut butter + cheesecake frozen yogurt with cookie dough on top. 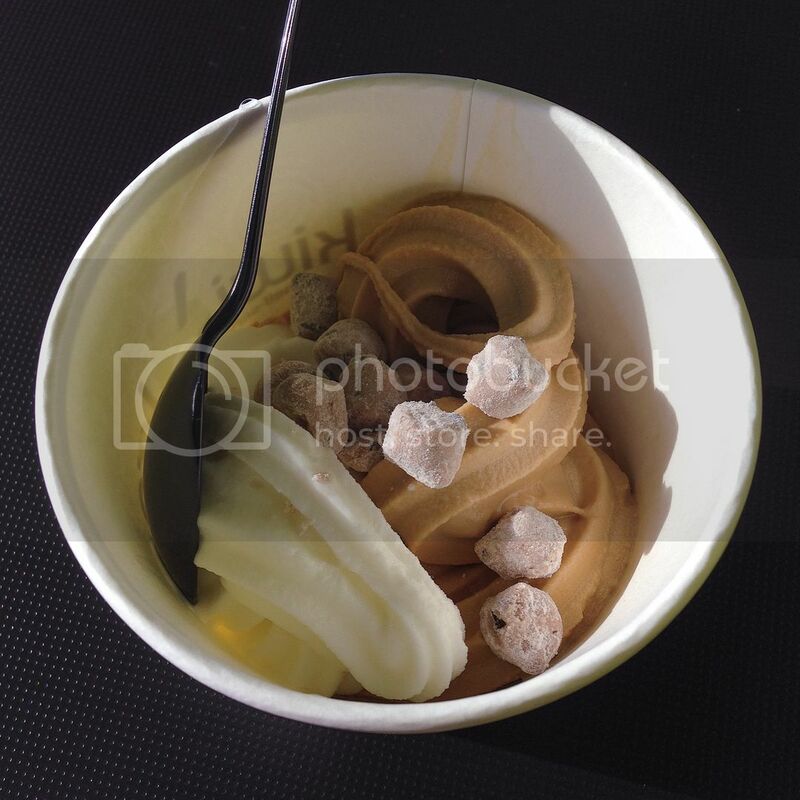 I am addicted to frozen yogurt. 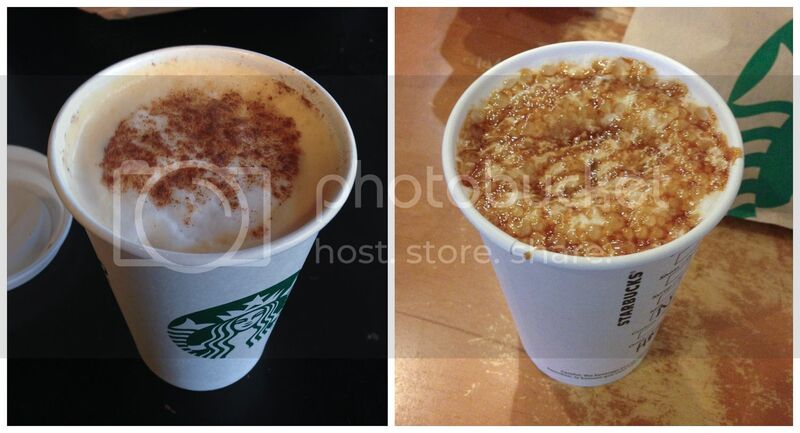 Starbucks dates with my man (and pumpkin spice lattes, of course). 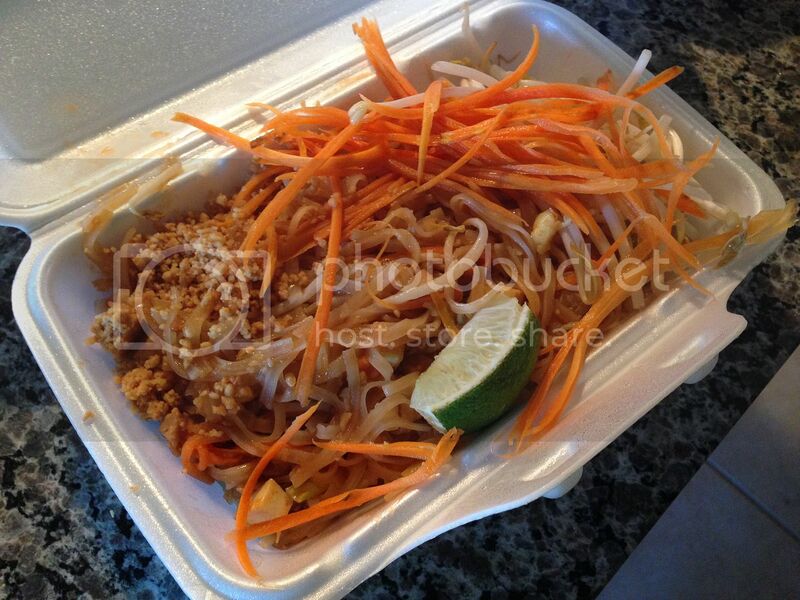 Take out pad thai - probably my favourite type of take out! I've been on a huge brussels sprouts kick lately and have been eating them all the time. 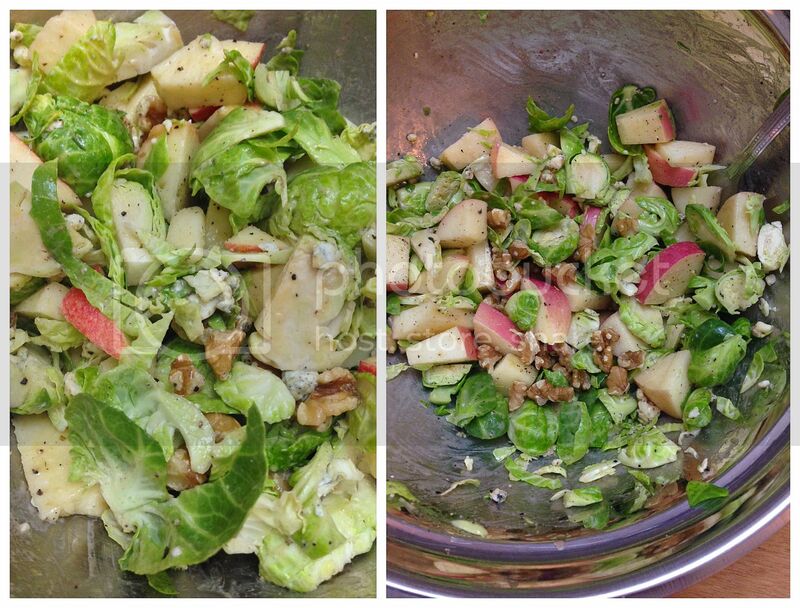 I've made this salad with raw brussels sprouts, apples, walnuts, and blue cheese more times than I can count this month. So good! 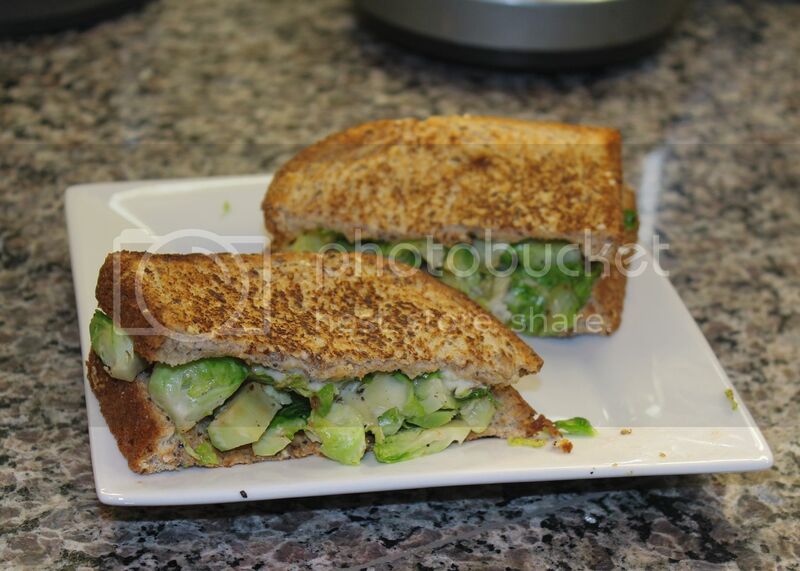 I also made a brussels sprouts and blue cheese "grilled cheese" for a quick dinner one night. I'm obsessed with blue cheese lately! For breakfast, I've been loving stirring pumpkin puree into my yogurt along with a dash of pumpkin pie spice - instant pumpkin pie yogurt! 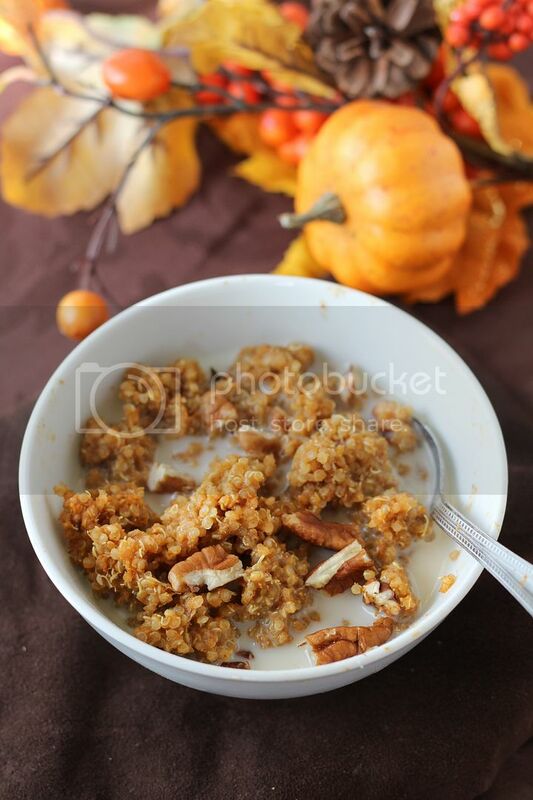 I've been eating it with both pumpkin flax granola and chocolate protein granola, but the latter is my fave! Naan pizzas are one of my stand-bys when I need a quick dinner. 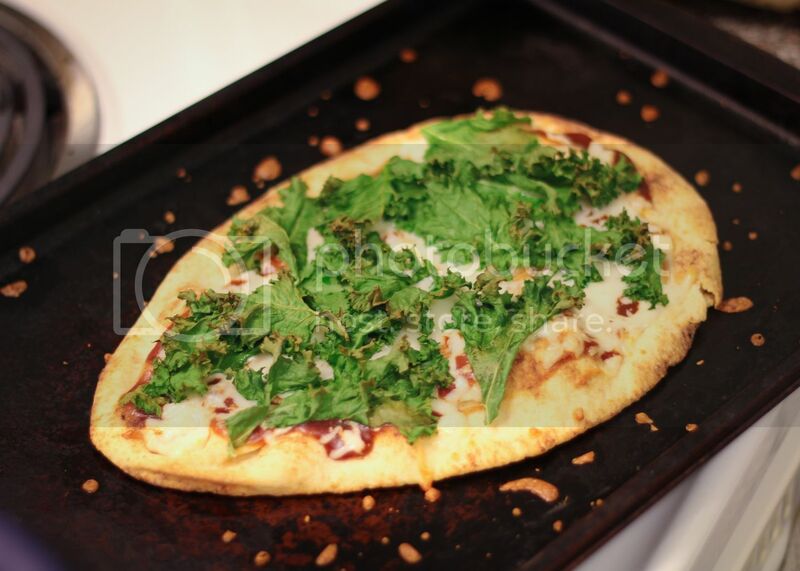 This one had bbq sauce, mozzarella, and crispy kale - strange but so good! Ryan and I went out for breakfast at the Early Bird in London (which has been featured on the show You Gotta Eat Here!) 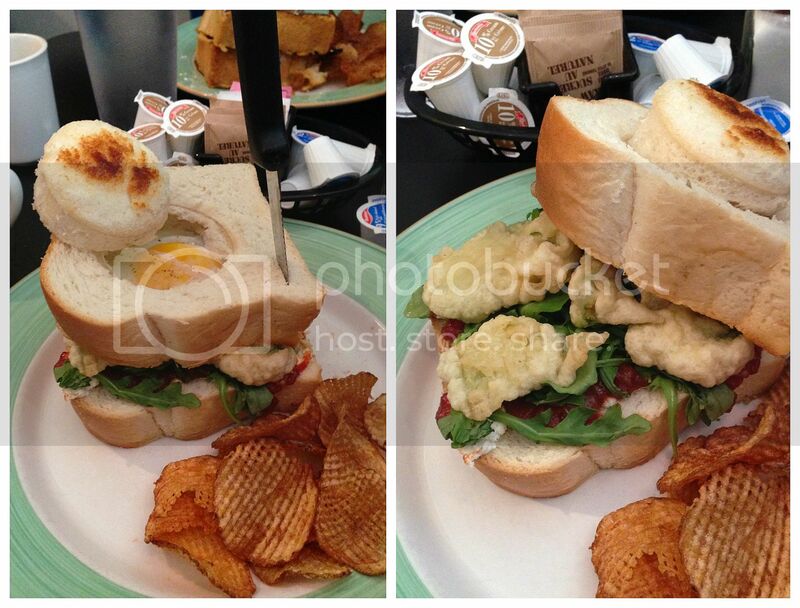 and I ordered the toad in a hole, which is an egg fried into a slice of thick bread, served as a sandwich with avocado tempura, tomato chutney, goat cheese, and arugula. I didn't eat the chips or the majority of the bread because this meal was huge, but needless to say, it was delicious - and so creative! If you're ever in London, Ontario, you have to try this place - just bring an big appetite! 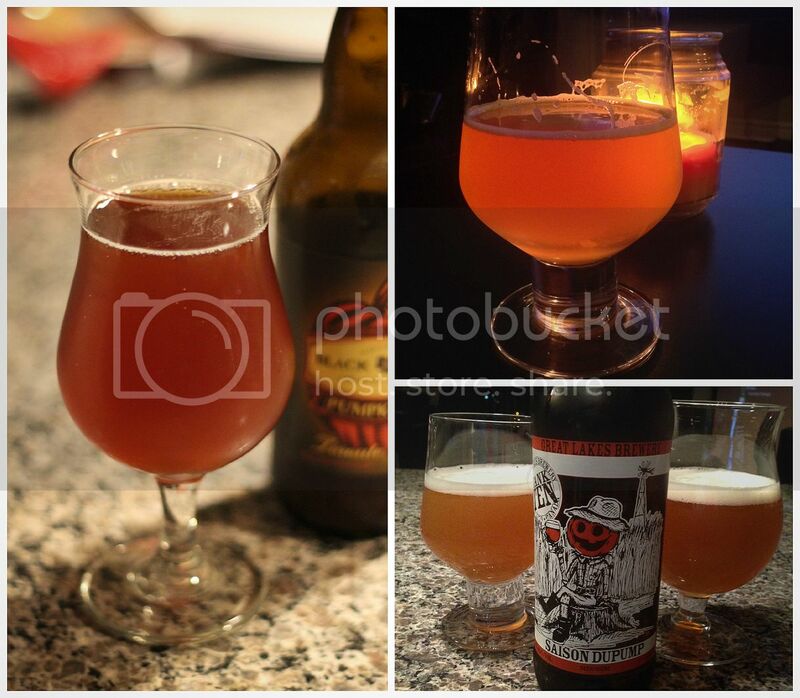 I've also been enjoying the return of pumpkin beers lately - I haven't found one I absolutely love yet but there's still lots to try! That's it for this month - hope you all had a great September enjoying the last bit of summer and getting ready for fall! And happy weekend! I can’t believe it’s already October – I have absolutely no idea where September went (or the whole year, for that matter). I’m hoping this month goes a lot slower because fall is always over so quickly here and there are too many things to enjoy before they’re gone, like the beautiful red and gold leaves on the trees, sunny weather with crisp air, being able to wear light jackets and boots before the parka and heavy boots come out for what feels like forever, and of course, pumpkin spice everything! 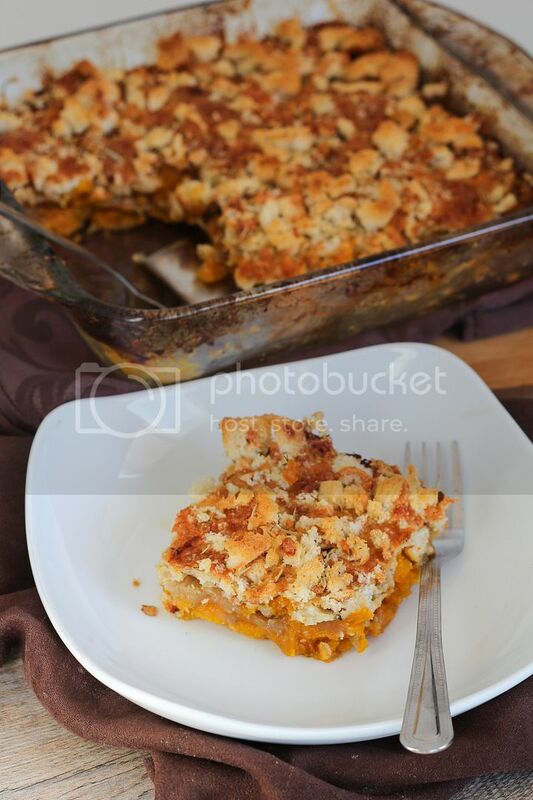 This is the first pumpkin recipe I’ve made this fall and I know I’ll be making it several more times before the season’s over! 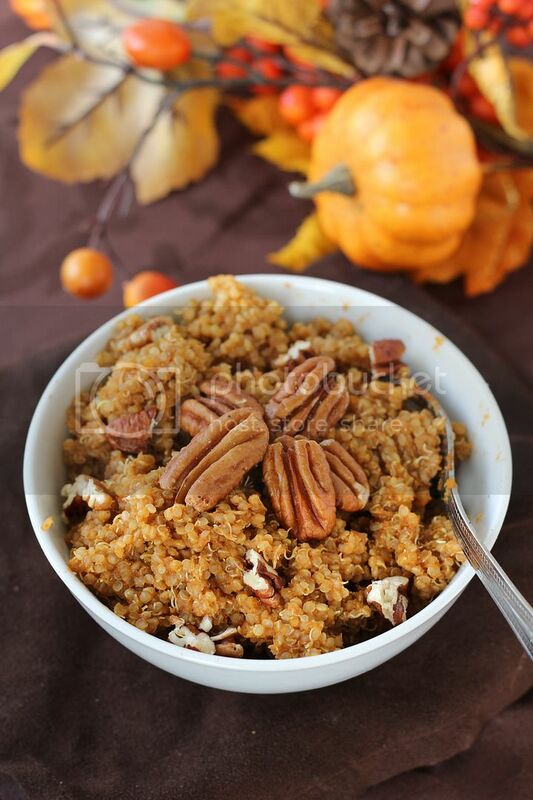 I love pumpkin oatmeal, but replacing oats with quinoa retains the comforting porridge-like texture while adding lots of protein to give you energy to start your day! 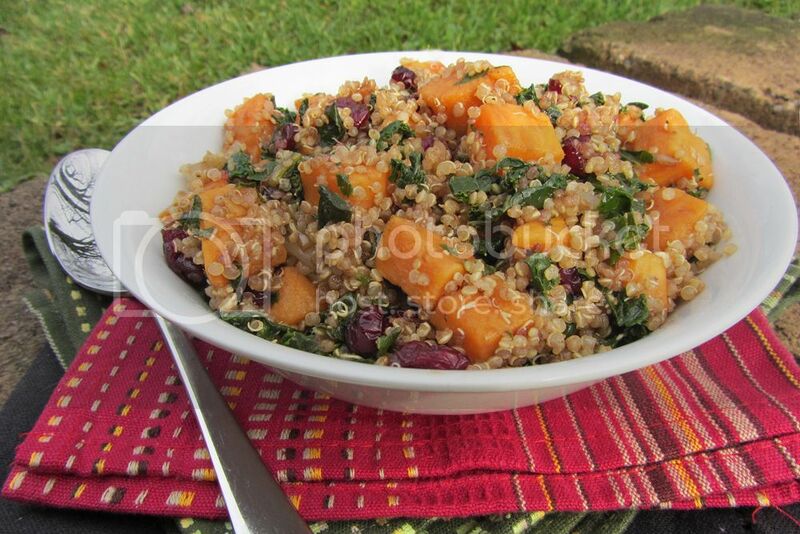 And because quinoa can be left alone while it cooks, it’s still easy to make this on a weekday morning while you’re getting ready for work or school. 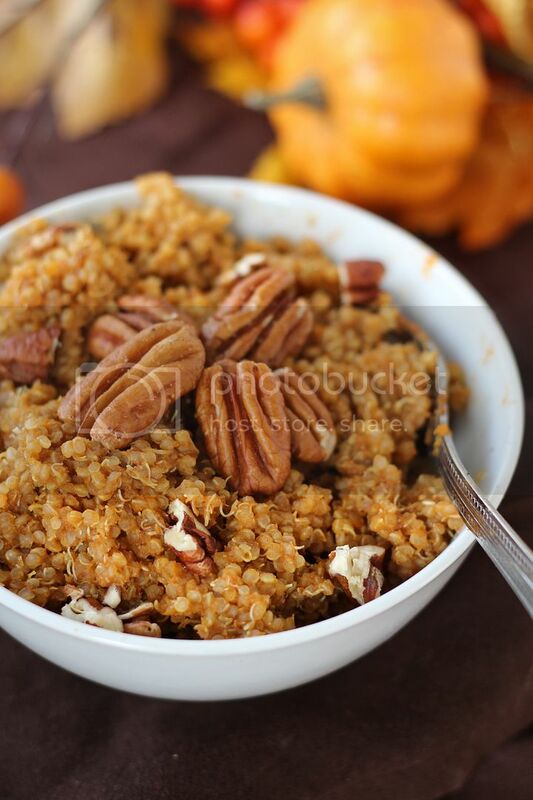 All you need to do to turn plain quinoa into this cozy pumpkin breakfast quinoa is replace some of the cooking water with milk, then stir in some pumpkin, vanilla, spices, a little maple syrup for sweetness, and top with some pecans for crunch. 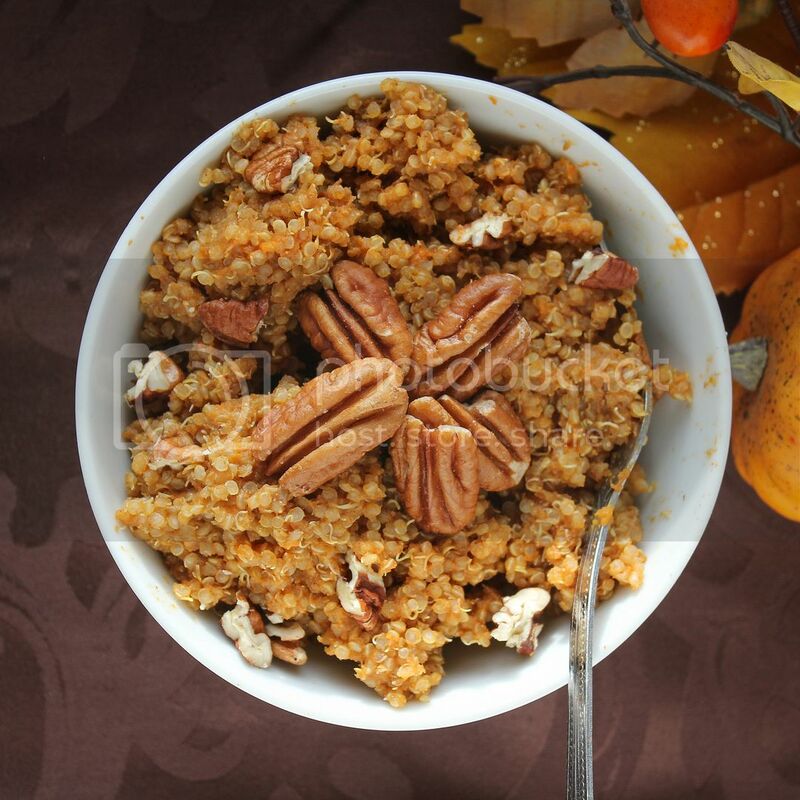 If you usually add milk to your oatmeal, you can do the same with this breakfast quinoa too – your choice! 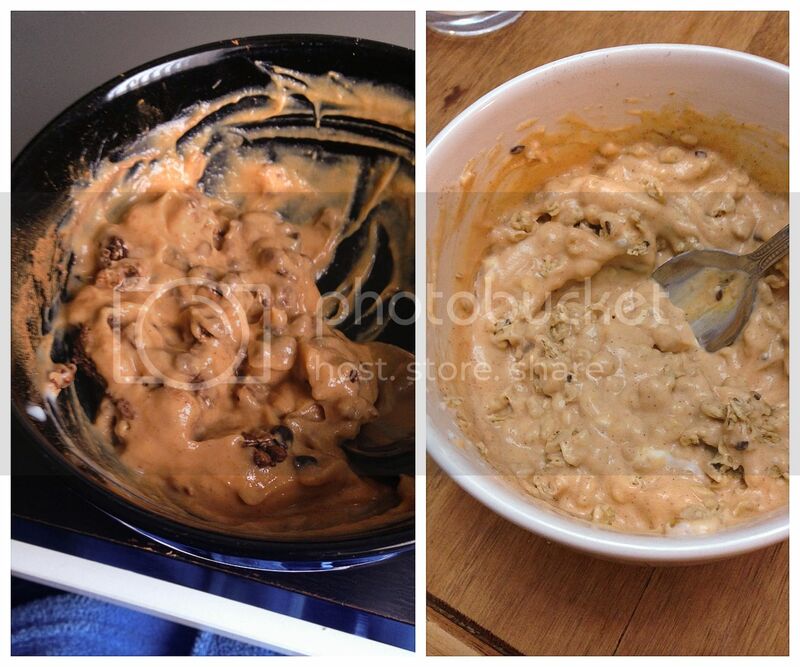 And if you want this to be even more of a treat, feel free to throw in a spoonful of chocolate chips!